This page is a step by step guide to help you to understand the trip to reach Paris to Giverny by yourself. We propose the cheapest itinerary to get to Giverny: by public transportation (metro + train + bus). Prepare your travel to reach Giverny before going. 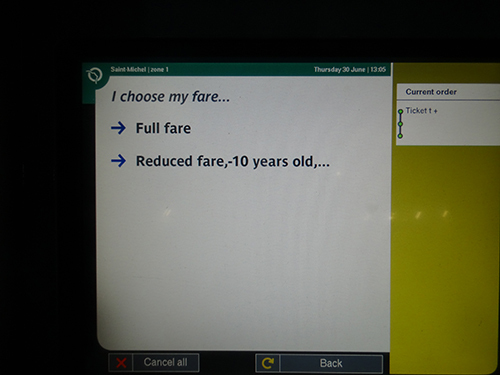 If possible, buy your train tickets in advance online. Trains are not so frequent (8:20, 9:20 and then every 2 hours), check the timetable. If you want to enjoy your day in Giverny and avoid to visit the top locations too quickly (Monet’s Garden and House, the Museum of Impressionnisms), take the train at 8:20 to arrive for the opening of the Monet’s Garden and House at 9:30. Taking into account subway tickets, the train and the shuttle, the whole trip to Giverny from Paris cost around 45 € per person. Add to it the ticket of the Monet’s House and Garden of 9,5€ per person. To check on discount charges, you can visit the official website. 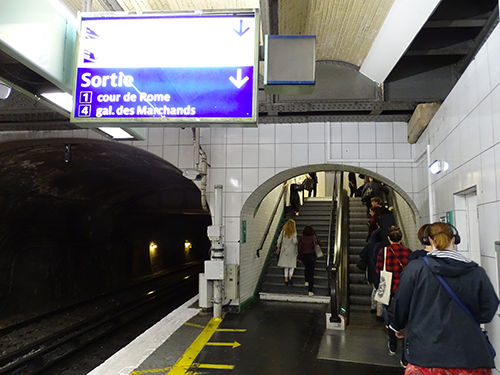 Step 1: take the metro to Paris Saint-Lazare station. Step 2: take the train from Paris Saint Lazare station to Vernon, a small but pleasant town worth a shot. 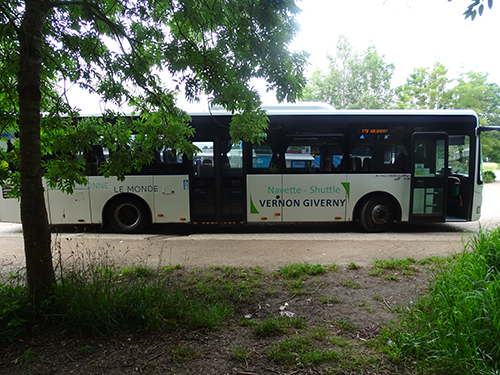 Step3: when in Vernon, a shuttle is waiting for you in front of the station to go to Monet’s place at Giverny. Each steps is described in detail below. 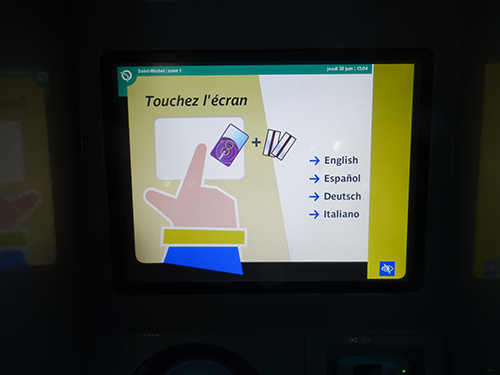 You can read the 3 Steps or just one you need to reach Giverny. 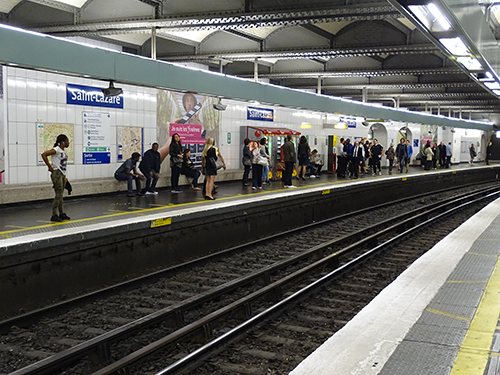 To go to Saint Lazare station, take the Parisian subway! Every train here goes to Northern France, including the beautiful region of Normandy. In Paris, Saint Lazare is one of the biggest station. 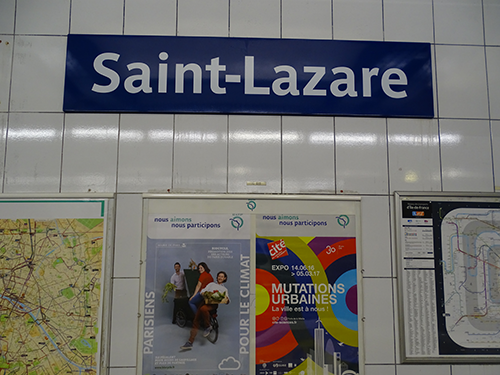 If you need help to get to Saint Lazare, please find our best practices below. If not, check directly step 2. Go on google Map to find it. Type the address of your hotel in Paris and check the nearest metro station from your hotel. 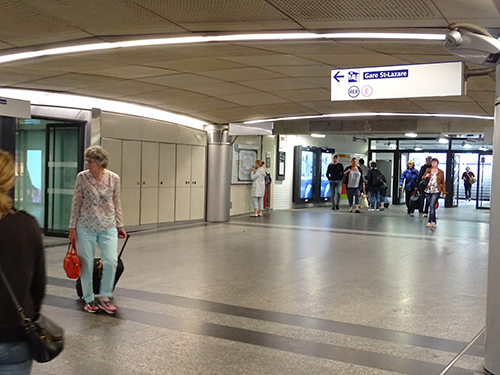 The metro station is mentioned by the sign: . Click on the M and the name of the station will appear. When you are in the metro station, buy a ticket. 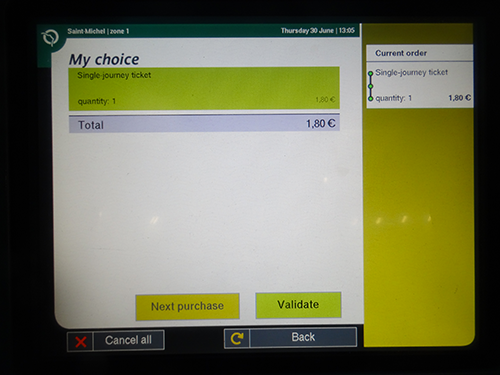 Standard ticket (one adult) costs 1,80€ and can easily be bought at ticket machines (English menu included). 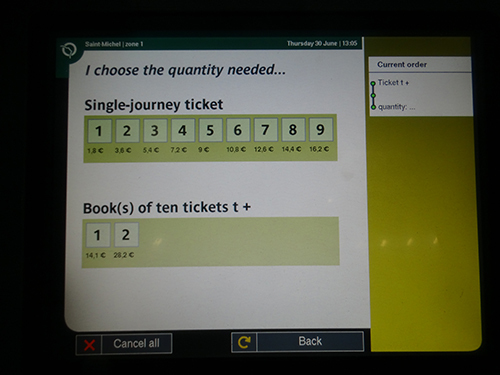 Choose the “ticket t +” (add image) which enables you to take the metro, the bus or the RER. Lucie’s Easy tips 1: each ticket has a 2-hour-availability, we advise you to directly buy 2 tickets to avoid queuing up twice. Lucie’s Easy tips 2: never buy a transport ticket from an unknown person, it can be a fake and you would eventually get a fine! 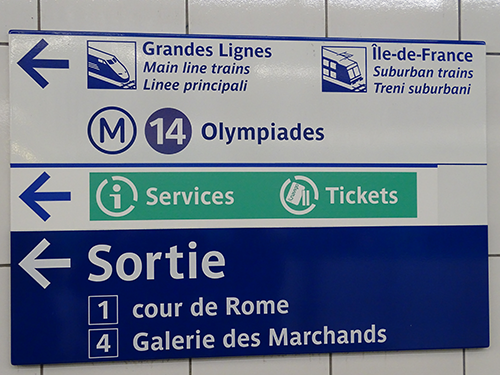 Line 14 (purple) going from Saint-Lazare to Olympiades. 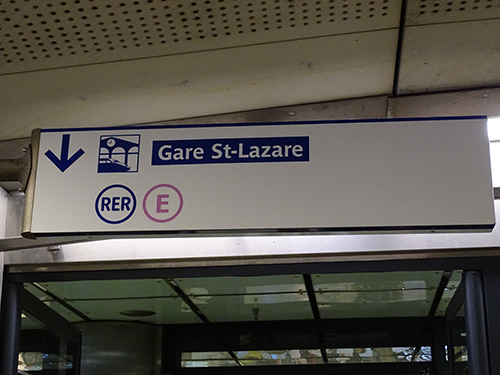 Once in Saint Lazare metro station, follow the « grandes lignes, main line trains » sign (add image), then take the escalators and follow the “Gare Saint Lazare” sign. In any case, way to reach the train platforms is up. You are now in the station main hall! 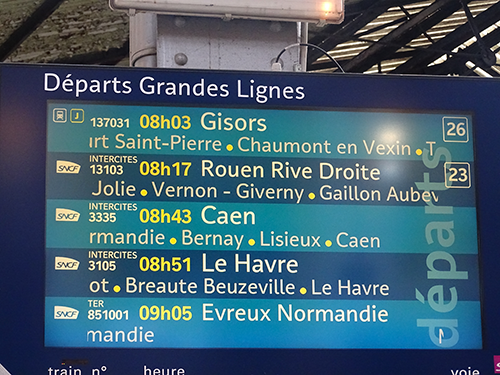 The quickest and easiest way to go to Vernon from Paris is to take train (SNCF line) heading for Rouen Rive Droite. Be careful, trains are not so frequent (8:20am, 9:20am, then every two hours). Take a look at the SNCF official website to check the timetable. If you want to be sure to get nicely seated on-board, we advise you to get to your train 15 minutes before it departs. Standard one-way ticket (one adult, second class) to Vernon is charged 15€ (we advise you to directly buy way-back ticket to avoid wasting time and energy). Book your train ticket online. Find it on here. If you have any problems, ask your questions to an agent or station staff at the reception desk within the station. 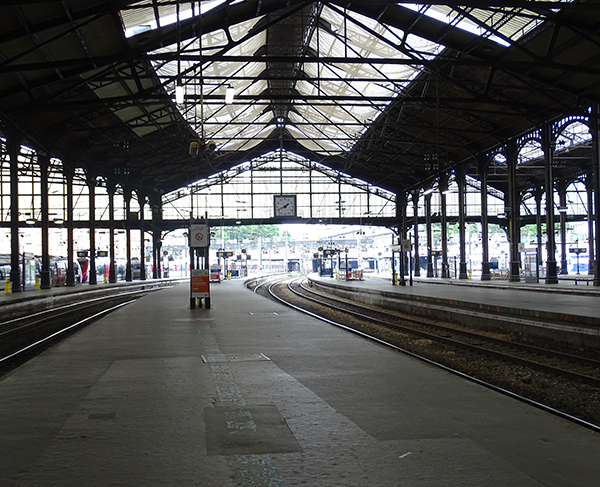 seek for train heading for Rouen Rive droite to find your platform (Jolie – Vernon – Giverny – Gaillon). Normally the train leaves from tracks 20-25. Once on board, you will progressively leave the landscape of the capital for the charming views of French countryside. From Vernon station to Monet’s House (4 miles one way), you have 4 options : bus, taxi, bike or on foot. Each solution is very easy to find. The quickest and cheapest way is to take the bus, there can be some waiting! In Vernon, take an underground passage and follow the taxi-bus signs. Each shuttle matches train arrival and departure from/to Paris. Find more information to know timetable here . 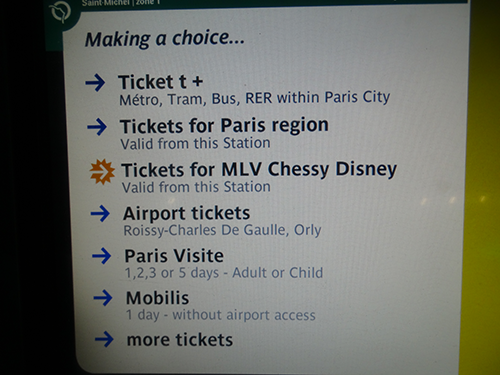 It takes 15 minutes to reach Giverny and return ticket costs 8 €. Be careful: prepare some cash upstream, the only way to pay the driver! Comfy but slightly more expensive (one way cost 15 €), taxis wait in front of the station of Vernon. c) Bike : nice trip ! 7 km to warn up legs! 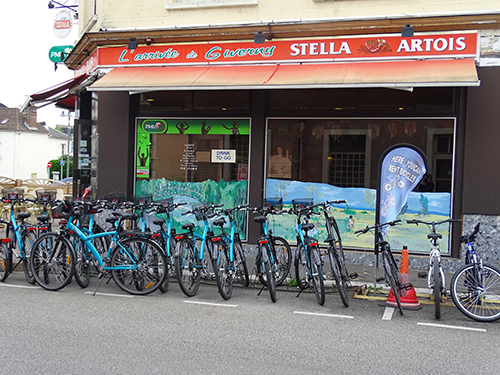 You can rent a bike (return trip: 14 €) at L’arrivée de Giverny, the café facing the train station (bike to be returned to this same place). The trip will take around 30 minutes. 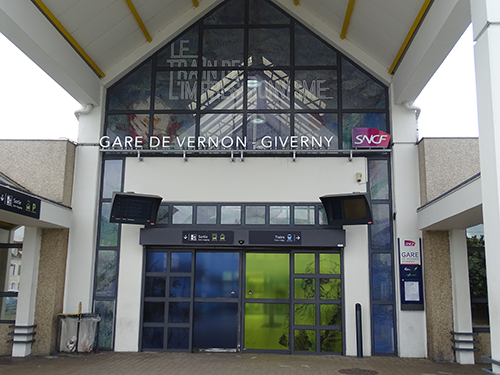 Useful information: L’arrivée de Giverny, 3 place de la Gare Vernon, tel +33 2 32 21 16 01. Open every day from 9am to 11pm. Instructions: follow the bike road signs. Cross Vernon taking the big street Albufera, then cross the bridge. On the banks of the Seine, please observe the ruins of the ancient bridge of Vernon and a mill from the XIXth century. 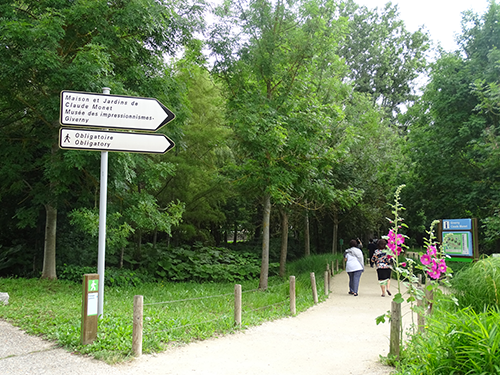 Then, turn right after the restaurant Les Tournelles (photo). It will take around 1,5 hours. Are you up to the challenge? Then follow the bike/pedestrian road signs and take a taxi or bus for the way back. 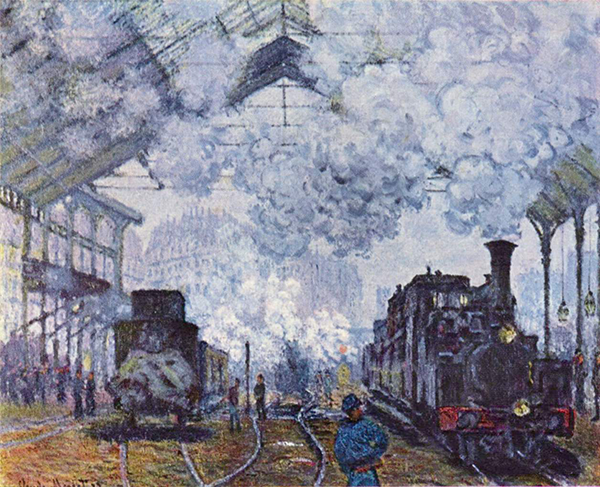 TIPS: Good and practical offer for public transportation : the “train de l’Impressionnisme”. You can buy a pack « destination Giverny ». It includes return ticket Paris – Vernon – Giverny, a pass for the museum of Impressionnisms and the Monet’s House and Garden and other advantages. It costs 55 €. If you are interested, book it online on this website. Caution: this offer is week-end-available exclusively, high traffic days. The trip is a 74 km long and should take around 1 hour and a half for 74 km trough A 14 or A13. Leaving Paris from Porte de Saint-Cloud (westside of Paris), follow A 13 toward Rouen for 55 km, exist at Sortie 14 (Bonnières) or 16 (Douais) to Vernon and follow Centre Ville signs, then signs to Giverny. The A13 is free until Mantes-la-Jolie, further it cost 2 € until Giverny. Leaving from Porte de la Chapelle (north of Paris), follow A86, A15 or N14 toward Rouen then Giverny. You want to avoid the highway for a more pleasant trip? It is possible! Leave the highway before the toll (green road sign Vernon) and take the N15 crossing the cities of Poissy, Rolleboise and Bonnières. Then, cross the Seine and follow the direction of Beauvais. Finally, turn right and follow the D5 on 5 km. The main street, where all keep points are located, is the street Claude Monet. In Giverny, parking zones are free and you have several of them. Let’s start your visit, we hope you enjoy it! C. Travel on boat from Paris to Giverny? From Paris, the Seine runs all along Normandy. Unfortunately, it is not possible to reach Giverny with a private boat. Only operating tours propose cruises for several days all around Normandy.